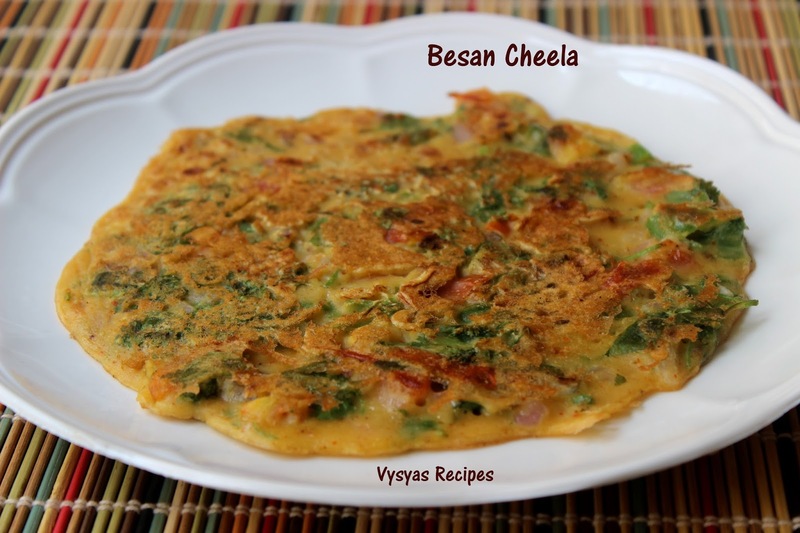 Besan Cheela is an Easy North Indian Breakfast Recipe made with Besan flour as Main Ingredient.It can also be taken as brunch,evening snack or Dinner. it can served with Green Chutney. you can add veggies to it to make it more Nutritious. It is an Instant Recipe. 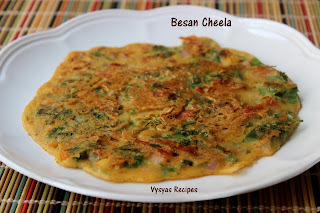 Cook Time : 2 Minutes Per cheela. Besan flour - 1 Cup. Chop Onion,tomato,Coriander leaves & Green chilly. Take a wide vessel add Besan flour,chopped Onion,tomato,coriander leaves,Green chilly,Cumin seeds,Chilli Powder,Garam Masala & salt.Mix well. Add water little by little to make the batter,slightly thinner than dosa Batter, consistency. Heat the tawa, take ladle full of batter & spread Gently.Drizzle some oil. Cook until the cheela leaves the edges of tawa,then flip Gently. Cook till Golden spots Appear.Then serve hot. you can add Grated Carrot & Cabbage, to make it Nutritious. Always cook in a Medium flame to get Golden spots.